Nearly lost in the exchange of invective between Mahmoud Ahmadinejad and Barack Obama is the former warning to put the latter on trial. Thomas Erdbrink and William Branigin offer details at "Iran's President Rebukes Obama; Candidates Reject Election Review" in the Washington Post today. praised protesters for showing "bravery in the face of brutality," described violence against them as "outrageous" and said opposition leader Mir Hossein Mousavi has "captured the imagination" of Iranians who want a more open society. Obama also dismissed Ahmadinejad's demand for an apology for previous criticism and suggested that the Iranian leader apologize to the families of those who have been arrested, beaten or killed in the crackdown. Ahmadinejad also vowed to take a tougher approach toward alleged meddling by the West during his second four-year term, which the government has said will begin this summer. "Without a doubt, Iran's new government will have a more decisive and firmer approach toward the West," Ahmadinejad said. "This time the Iranian nation's reply will be harsh and more decisive," to make the West regret its "meddlesome stance," he said. Comments: (1) This over-the-top bellicosity reminds me why I originally endorsed Ahmadinejad to win the June 12 elections and serve another four years as president of Iran. His aggressive comments might even awake an Obama to the inutility of nice words and gestures toward Tehran. 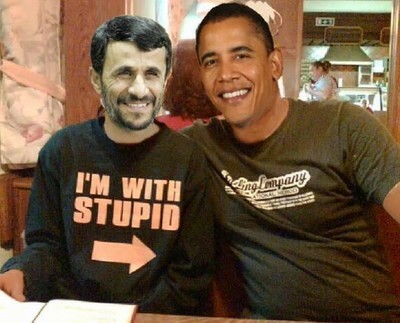 Ahmadinejad and Obama, in imaginary better times.